Below you can find the complete documentation for prettyLoader. If you are having problems with prettyLoader and need support, please come and ask your questions in our forums. If you got here by mistake, don’t leave! The main prettyLoader page can be found here. 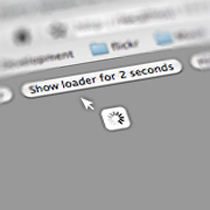 If you we’re not looking for prettyLoader, well too bad, but you can still read my blog here. Then, initialize prettyLoader. Put the following code before the closing tag of your body.